In The Woodlands, an iconic sculpture of a man lying half submerged in the ground rests in the median on the east side of the intersection of South Panther Creek and Woodlands Parkway, where it was installed by artist David Phelps in 1989. 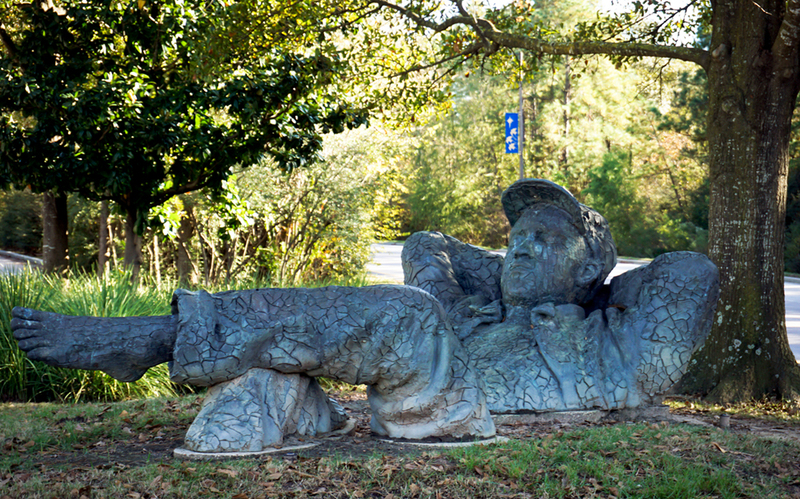 "The Dreamer" is a triple life-size mixed media figurative sculpture originally commissioned by the Connemara Conservancy for a temporary outdoor exhibit in 1987. It was then cast in a limited edition of three bronze castings. The first was commissioned by The Woodlands, the second was commissioned by the city of Palm Desert, California, and the third was commissioned by the Sterling Research Group of Collegeville, Pennsylvania. I reached out to David Phelps inquiring about the meaning behind the sculpture. According to Phelps, the sculpture's origins can be traced to his childhood home in California’s Central Valley Delta, where a maze of rivers meander and crisscross on their way to the San Francisco Bay and eventually, the Pacific Ocean. Middle River, Old River, and the San Joaquin River intersect to form the largest island in the Delta: Roberts Island. The threat of the island flooding left powerful memories and emotions with Phelps as he grew up, and sequentially influenced much of the artwork he created as an adult. "The Dreamer" image came to him in a vision brought about through extreme fatigue. He was working long hours in the studio and at two in the morning, turned and unexpectedly saw a wax head leaning in the corner of the studio. This triggered a full-blown vision of "The Dreamer" image in his mind. This was the only time one of his sculptural images developed in this particular way, and maybe not surprisingly, this image seems to viscerally affect people more than any of his other works. Speaking for myself, the demeanor of "The Dreamer" appearing to be in a blissful and meditative state represents the subtle inner peace and tranquility I feel when I come home to The Woodlands and am surrounded by the lush greenery and healthy forest of pine trees that I grew up in. This feeling, of increased happiness from being surrounded by nature, is something that I know most of The Woodlands residents enjoy- and not just because they tell me, but because it has been proven through scientific studies. Because so many aspects of human health and even longevity are negatively influenced by stress…green space is a promoter of human health, vitality and longevity. Our master planned community boasts a land ratio of 28% green space (that’s 5% higher than George Mitchell’s original vision for The Woodlands intended). As residents of The Woodlands, we are privileged to enjoy the psychological and physiological benefits of being surrounded by trees, while simultaneously experiencing the conveniences associated with living in an urban environment with the close proximity and high accessibility of our unique town and village centers.